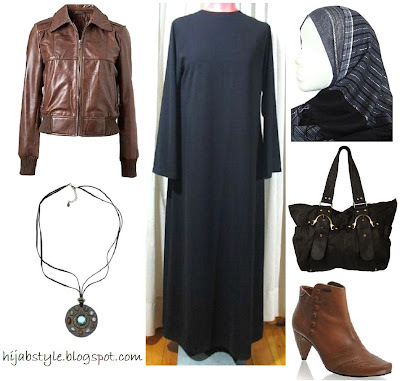 Chocolate leather jacket £140, Principles; pendant necklace £16, Monsoon; simple plain black abaya £20.57, 2hijab; striped hijab £5.99, Islam Orient; black leather tote bag £65, Dorothy Perkins; Firetrap side button ankle boots £95, ASOS. The bag is so gorgeous, tut.It's out of my price range and my mediocre wage packet cannot stretch that far. You're website's absolutely brilliant! It's really helpful, I was wondering if you could do a blog with clothing we could buy outside the UK, like Canada, the States, France. I've fallen for the jacket! it's gorgeous! hfm, I bet you could find something similar for a fraction of the price at Primark! Emdee, thank you :) Unfortunately I'm really busy so barely have time to keep up to date with the UK scene. I will be posting lots of links to Islamic clothing sites abroad though, so keep an eye out for those!